At last a Genuine Multi Chamber Professional Pond Filter Box that anyone can afford. We feel sure that these new units will prove a hit. The water flows through the chambers and is forced through this foam and bio media, Cleaned water then returns to Your Pond. Once installed and connected to a suitable pump the pond water will flow through the filter. This box filters are pump-fed, external filters with an integral UVC unit, ideal for being partially buried adjacent to your pond or being positioned above ground if desired. The filter may also be concealed at the top of a waterfall. Your filter is supplied with a translucent hosetail. This should be screwed into the threaded filter inlet. Pond hose size 20-40mm (3/4 " to 11/2") can be attached to the inlet hosetail. Cut the inlet hose to the size appropriate to the size of hose you are using. Then connect the hose from your pump to this inlet hosetail and secure with hose clips. 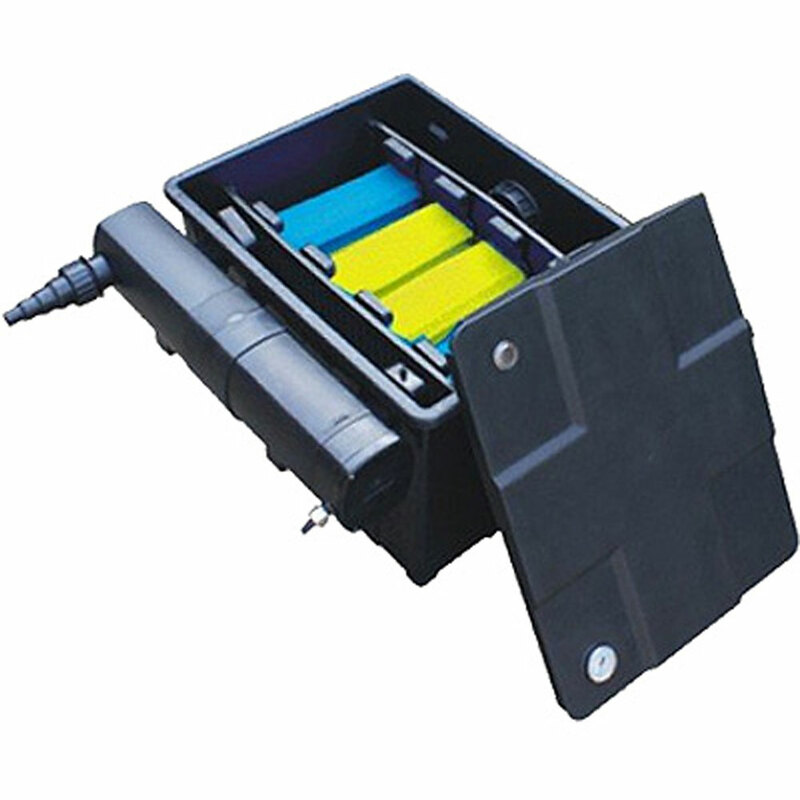 Your multi-chamber box filter comes complete with mechanical and biological filter media. The filter foam acts as a mechanical barrier to pick up solids whilst the plastic bio-media helps to developriendly bacteria. These friendly nitrifying bacteria help to convert harmful fish waste and other organic waste (ie, ammonia, nitrite) into harmless nitrate. This biological maturationprocess usually takes 6-8 weeks. It is recommended that you do not switch on your UVC during this period. NO PART OF FILTER UNIT SHOULD EVER BE SUBMERGED IN WATER. PondXpert box filters are pump-fed, external filters with an integral UVC unit, ideal for being partially buried adjacent to your pond or being positioned above ground if desired. The filter may also be concealed at the top of a waterfall. Your filter is supplied with a translucent hosetail. This should be screwed into the threaded filter inlet. Pond hose size 20-40mm (3/4” to 11/2”) can be attached to the inlet hosetail. Cut the inlet hose to the size appropriate to the size of hose you are using. Then connect the hose from your pump to this inlet hosetail and secure with hose clips. Your multi-chamber box filter comes complete with mechanical and biological filter media. The filter foam acts as a mechanical barrier to pick up solids whilst the plastic bio-media helps to develop ‘friendly’ bacteria. Switch off any electrical items feeding or inside the pond (including the filter itself). The filter is supplied with everything you need to get started (including filter media, UV bulb and quartz tube for the UV). Over time these parts may need replacing and can be purchased from your retailer. The multi-chamber design of the unit means you are free to test other media types (Japanese matting, Alfagrog etc) should you desire. Your pondXpert filter comes complete with an integral drain. To periodically drain the sludge from the base of the filter simply unscrew the drain cap. This drain point can also be used to backflush out debris if required. Disconnect the unit from the electricity supply. Push open the top access chamber to the UV. Remove the UV Clarifier unit by gently pulling the retaining clips. Unscrew the wired end-cap by rotating anti-clockwise. Remove the UV bulb by gently pulling out of the electrical connection. Insert a new UV bulb by gently pushing into the electrical connection. Re-assemble the end cap by rotating clockwise. Clip the UV unit back into the top housing and reposition the top lid in place. Your filter works by connecting it to a solids-handling filter via the stepped hosetail inlet via pondhose. Dirty water enters through the multistage hosetail past the UVC where it is pushed through foam into the first chamber of biomedia. The water is then flows into a second chamber and is forced through foam up and over into the final chamber.